The end of the year means holiday season around Australia, especially in Melbourne. With the lead up to Christmas and New Year, together with shopping and the warm summer weather makes it one of the best times to visit the city. Looking for some December Melbourne Activities to do with friends? Let us inspire you because summer is almost here. 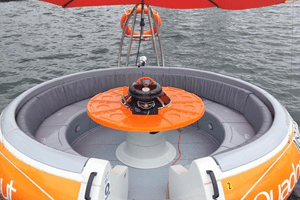 The Aqua Donut is a flotation device that has a BBQ station. It gives visitors a unique DIY experience as they float along the picturesque waters of the Docklands. Seating as many as 10 people, the donut is made of high-end fiberglass so it seamlessly glides along the water. Therefore all you need to bring is your food for the BBQ and drinks. The Aqua Donut operates from Friday to Sunday and on public holidays. One of the best December Melbourne Activities to attend is the Boxing Day test. The Boxing Day test which is held in Melbourne annually. It involves the Australian cricket team and the opposing national team touring Australia during summer. The game begins on Boxing Day (Wednesday 26 December) and is played at the Melbourne Cricket Ground (MCG). Don’t miss the Australian’s Men’s Cricket Team take on India because it’s their first appearance in Australia since 2016. Land Rover Polo in the City is part of the urban Polo circuit and is the largest in the world. Most importantly it is a rare opportunity to witness Australian and International polo stars in live action. It is the perfect day out friends and you get to enjoy the excitement from the world’s fastest growing spectator sport. This years event will be on Saturday 1 December at Albert Park. This December Melbourne music fans have plenty of choice, with local and international artists performing. 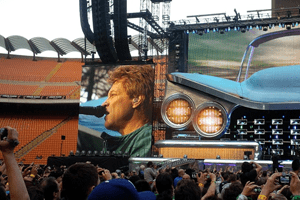 The month starts off with Bon Jovi and his This House is not for sale tour at the MCG on Saturday 1 December. The global rock icons and newly announced Rock & Roll Hall of Game 2018 inductees promise to give audiences a memorable experience. While comedy fans can , Kevin Hart is bringing his successful ‘The Kevin Hart Irresponsible Tour‘ to Melbourne. He will perform in a 360º in- the-round which is the first for a tour of this scale. The tour will reach Rod Laver Arena on Wednesday 5 December and Thursday 6 December. Fans of Daryl Braithwaite and Thirsty Merc will be excited that they are joining forces again. Enjoy the “Days of Summer” concert at The Palms at Crown on Saturday 15 December. There is nothing quite like watching a film under the stars at the Moonlight Cinema’s. 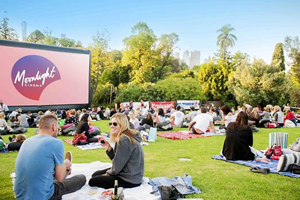 In the surrounds of the beautiful Botanic Gardens, settle back with friends and enjoy a great movie. This summer’s programming includes a mix of acclaimed Oscar hopefuls and retro screenings. The full program will go live on Thursday 15 November and screenings run from 29 November to 31 March 2019.